Wednesday January 13 1909 I did not have so very much house work to do I made some tatting and some mending for Will It is still very cold Will busy with the care of stock and keeping fires Thursday January 14 1909 I was busy with work all forenoon and had dinner early went down home at 12.12. Mother is not very well. I came up town and got a lot of things. 6 each pretty tea plates with my tickets. I got supper and did evening work. Friday January 15 1909 I was up early did a lot of work so I got away at 12.12 Went out to Aunt Emmas and from there to Mrs Lovell Swishers I took for the tatting for her pillow cases. I went into Mrs Smiths and she went with me to Mrs [illegible] to the Missionary meeting. I came down town to come home at 5.30. Did evening wok and some telephoning and began the tatting for Mrs & Dr [illegible]. 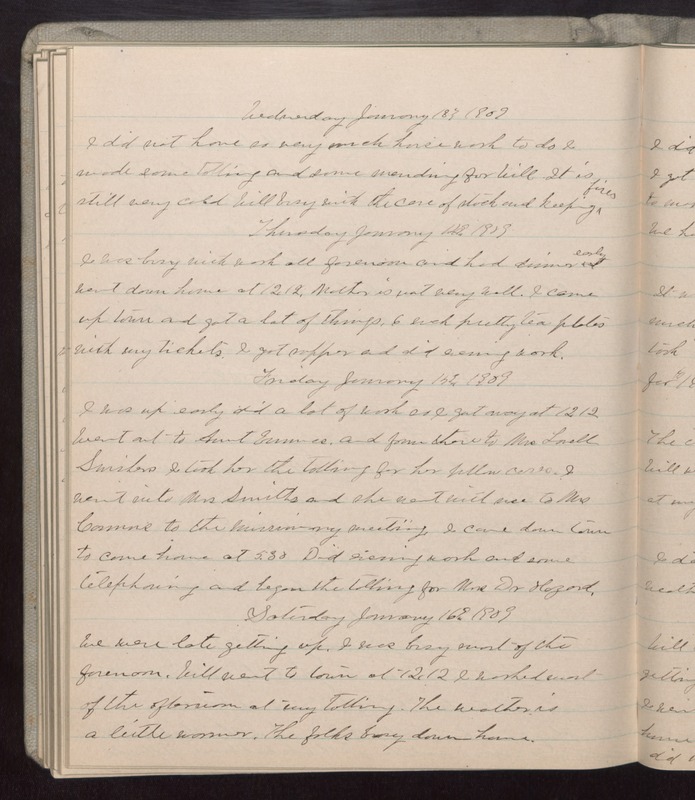 Saturday January 16 1909 We were late getting up. I was busy most of the forenoon. Will went to town at 12.12 I worked most of the afternoon at my tatting. The weather is a little warmer. The folks busy down home.